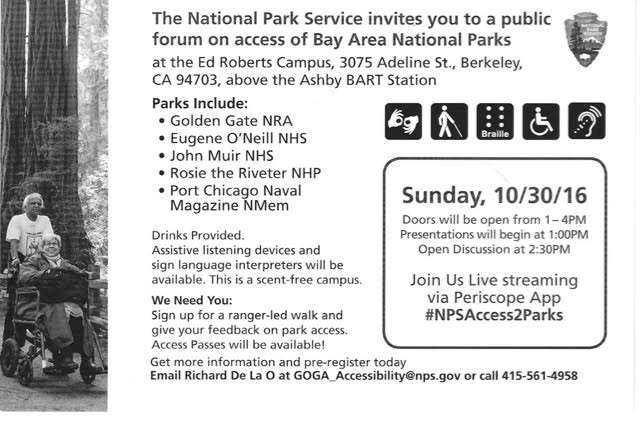 The National Park Service invites you to a public forum on access of Bay Area National Parks at the Ed Roberts Campus (3075 Adeline St., Berkeley, CA 94703, above the Ashby BART Station) on Sunday October 30, 2016. 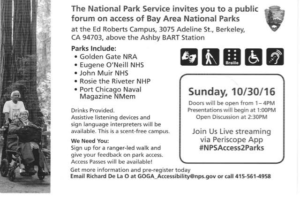 Sign up for a ranger-led walk and give your feedback on park access. Access Passes will be available! Doors will be open from 1 to 4 PM. Presentations will begin at 1 PM. Open Discussion at 2:30 PM.